So you say you want updates???? Sorry for the absence,actually been able to sleep like a normal person for a few days and being busy kinda slowed things down. You may get a few updates today on various topics that will range from any Pirate or Indian deals at today's trade deadline to an autograph based post to whatever else comes to mind. I am not going to get into Pirate nuance of the last four games ( a 2-2 split) against the Padres and Rockies,but will be writing about the up and down moves of personnel and more discussion on the Yankee deal before it fades into the background with any moves today. 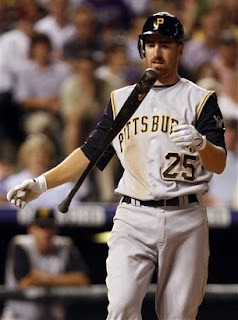 The Pirates added four new players to the rosters to replace traded players and Adam LaRoche's being placed on the DL. Jeff Karstens was added from the Yankee trade. Karstens is expected to start either Friday or Saturday in his first Pirate appearance,Davis has already pitched twice from the bullpen (earning a win on Tuesday),while Pearce and Bixler are expected to see some action,but they are not guaranteed to step into the lineup full time. I would like to see Pearce get the full time right field spot and keep Jason Michaels doing what he does best-pinch hit and in the 4th outfield spot. Bixler needs to be the top infielder off the bench and should get the time vacated by Freddy Sanchez with Freddy having back problems,but if it was anything like the last time that Bixler was up,look for a lot of Luis Rivas.Ugh. I don't think that Bixler is ever going to be the full time answer at short or second,but one never knows unless he gets the time on the field-after all you know what you have in Rivas already. Karstens will get a chance to earn a spot in a less than stellar rotation and Davis could move up a step in the bullpen corps if John Grabow is moved at the deadline. I do not understand why the media is so down on the Nady trade. Jose Tabata is a gamble,but all prospects are. I would have rather had a higher upside pitcher in the deal instead of Jeff Karstens,but remember Xavier Nady is having a career year and he is quite injury prone. His value will never be higher than it was last week. This is an example of the national media knowing very little about minor league baseball so therefore they go to someone that does. That person might not liked the deal and therefore the deal was bad. I liked it and think it is is the type of things that the Bucs need to be doing. Jamie Romak and Jim Negrych were moved to the AA level from Lynchburg. The move seemed long overdue and if either player can be considered a real prospect,they needed to be challenged by advancing higher in the organization. Lots of wild Pirate rumors flying tonight and some sound really good,but I will believe it when I see as some seem a bit crazy. 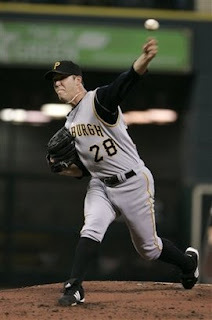 Jason Bay would be missed,but a deal with Florida looks to be just the kind of deal that the Pirates need to make. From the better late than never dept-Congratulations to Erik Arnesen for his promotion to High A Potomac. Erik pitched well in his first High A start is he allowed just 0ne earned run in six and two thirds innings against the Wilmington Blue Rocks. The Burger Division poll ends today and in the event of a tie,there will be a runoff and the non-burger division will be pushed back a week. All for now,back later with some signing stuff,any trade news and a chuckle toward "Roll Over" Dungy! I have not watched today's game yet,so that is why you are getting a recap of Saturday's game now. John Van Benschoten basically lost (1-3) one last game for the Pirates as he was ripped for seven runs in less than two innings in the Pirates 9-6 loss to San Diego. Seven runs,four walks,two three run homers and one bus ticket out of town. Jason Michaels (5),yet another bomb from Adam LaRoche (15) and Jose Bautista (12). The other shining star was T.J. Beam from the bullpen with 4 scoreless innings of just one hit ball. Best performance all year from Beam and his work took a hopeless contest and made it worth watching throughout. Since todays game is over,I will not be putting a pitching matchup up for today. The charity was laudable and I didnt even mind the constant updates and shilling for higher bids,but all too often game action was missed for scintellating shots of Paul Alexander on the phone and the game did not flow well. Hopefully,if this is done in the future,FSN can do a better job of covering both during the game. Two great fights over the weekend in the 147 lb division. On Friday on Telefutura-Jesus Soto-Karass suddenly ended a terrific fight with one right hand in Round 8 of his fight with David Estrada to win the North American Welterweight title. While Antonio Margarito won the WBA crown with an 11th round stoppage of previously undefeated champ Miguel Cotto in a mild upset. That fight will likely be on HBO next Saturday,but reports say it could be the fight of the year. The Cleveland Indians made two pretty nice deals as Casey Blake was shipped to the Dodgers for a good catching prospect in Carlos Santana and power throwing Jonathan Meloan and former top Cardinal pitching prospect Anthony Reyes was obtained for Luis Perdomo,who was until recently the closer for the Kinston Indians. Both bring in talented arms and Santana is tearing up the California League with awesome numbers and adds to Cleveland's seemingly endless supply of catchers. One can never have too may backstops! Meloan is a hard thrower that could help in the pen and just two years ago Reyes was considered untouchable by the Cardinals and could just need the proverbial fresh start. And finally,the XM-Sirius merger is done. No word on how it is going to work yet,but DCRTV and Dave Hughes has a terrific idea on how the merged company could have some positive PR right out of the starting blocks. "If the soon-to-be-merged SiriusXM wants to show that it's seriously going to "show the love" for its combined subscriber base, the first thing new CEO of the expanded firm, Mel Karmazin (right), should do is to take a batch of Sirius's most-popular channels - Howard Stern, NPR, NFL - and make them immediately available to XM subscribers on the XM platform at no extra charge. And ditto with XM's most-popular channels - Oprah, MLB, O&A - to Sirius subs on the Sirius platform. Do it from "day one" of the new married company. Since the two satrad systems are technically incompatible, it could be quite a while before XMers get Sirius stuff, and vice-versa, via new receivers. Mel, this would be a great way to get XM and Sirius subscribers "feeling good" before the receiver, programming, and billing hassles that will undoubtedly be coming with the new SiriusXM, or whatever it'll be called." Dave-I could not agree more! 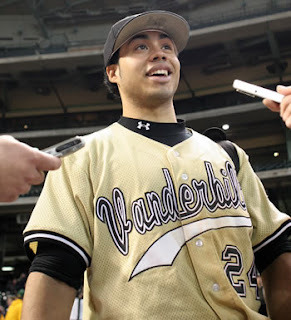 Pirate Gm Neal Huntington has finally pulled the trigger on his first major deal by sending Xavier Nady and Damaso Marte to the Yankees of the Big Cesspool and bringing four prospects to the organization. When the news broke Friday evening,the rumored Pirate return was different than the actual deal. 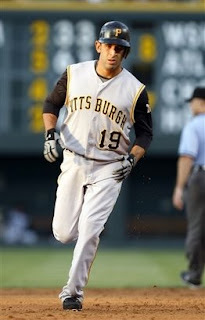 Outfielder Jose Tabata is the centerpiece of the deal and righty Ross Ohlendorf is the most likely player to see action in Pittsburgh first,but minor league pitchers Phil Coke and George Kontos were supposedly in the deal,but were replaced by pitchers Daniel McCutchen and Jeff Karstens. In my opinion (and this seems to be a minority),the rumored trade was better than the actual swap. I think in the end,Huntington did what we always criticized Captain Dave for-knuckling under to get players closer to Pittsburgh instead of getting more talented players. Perhaps it is because I am pretty high on Kontos,but apparently the hang up was that either Kontos or Coke had problems passing the physical and that is why the deal needed to be touched up. However,I still would have rather brought in pitchers with a bit more upside to replace the two new hurlers,although I have no real issues with McCutchen. It would not be out of the question that all three of the new pitchers could be seen in Pittsburgh sometime over the remainder of the season. 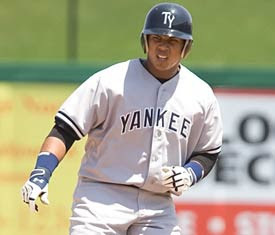 I am surprised about hearing some negatives about Tabata,who is currently sidelined with a groin pull. Some are critical of his lack of numbers at AA Trenton (only hitting .240),but he does not turn 20 until next month and could be simply too young to take care of the advanced pitching that one faces at the AA level. Tabata has always been compared to Fernando Martinez,as both are the same age,have been advanced quickly to the same levels and were New York prospects and Tabata never paled by comparison to Martinez. Tabata is projected (always the key word) to be a potential five tool player and could be a future star,if all continues to form. More on the deal tomorrow when I have more time to write. The Pirates used dumb baserunning and an inability to shut down the Padres when they were going for insurance runs to lose 6-5 on another tomato red uniform night. Running very short of time,so the base running incident came in the sixth . Chris Gomez (pinch hitting for Zach Duke) blooped a single to right to score Adam LaRoche and cut the lead to 5-4 with an out. But Doug Mienkiewicz tried to move to third and was easily thrown out and Gomez attempted to take second on the throw to third and he too was tossed out. I know the Mienkiewicz is a fun player to watch and he plays the game hard,but his aggressiveness sometimes bites the Buccos and on this night,it did. Zach Duke was the loser(4-8) allowing 5 runs in six innings,but failed twice to end innings that resulted in San Diego runs,while Tyler Yates allowed the final run that looked like no big deal at the time,but was eventually the game winner. Adam LaRoche homered in his first two plate appearances (13 and 14) to lead the Pittsburgh offense. Great fight tonight for the WBA Welterweight title between Miguel Cotto and Antonio Margarito. Looks to be a real action fight and the kind well worth watching. We like Cotto by decision. Part 4 with Wilbur Miller is below. I will attempt to get Wilbur's thoughts on todays trade soon as well. 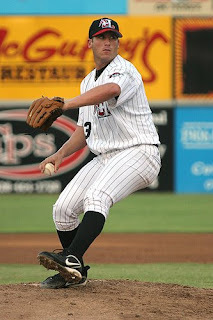 15)Brad Lincoln was impressive in his start in Hagerstown,what are your thoughts on Lincoln? Unlike Moskos, he looks to me like he has very good stuff and pretty good command. Considering that this is his recovery year, I think he’s done fine. I’m hoping he’ll really break out next year. 16)Hindsight is always 20/20,but looking back to the time,which concerned you more-the questions on the mechanics of Tim Lincecum or the heavy college workload of Lincoln? I guess a lot of people were scared off by Lincecum’s motion. I’d never seen him until after he reached the majors, so I didn’t know what to think. I do know that now, having gone back to look at a lot of the recent drafts and specifically at the heavily used college pitchers, I’d take one of those guys with an early first round pick only under extreme circumstances. 17)The recent release of Bryan Bullington closed a bad chapter for the Pirates,despite his limited upside from Day 1 was there anything that the Pirates could have differently with him? Not drafted him. His junior year apparently was just a fluke as he never showed that kind of stuff again. 18)If you had to pick one event of the Littlefield/Creech era that sent things beyond their repair in the farm system,what was it and did you see it at the time? The Ramirez trade, which I discussed above. I think the situation surrounding it caused a change in draft philosophy, but it became apparent only gradually over several years of bizarre focus on low-ceiling college players. There was no way to see it at the time unless you were party to their internal discussions. 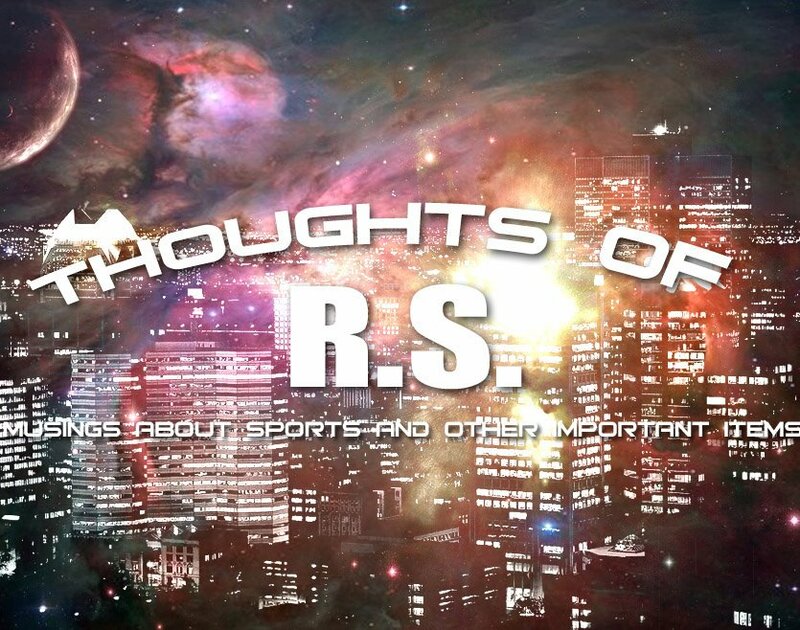 19)On the whole,it seems that keeping a balance between High School players and College players is the best way to go,but do you feel that way and if you lean one way or the other-which way? I prefer college hitters in the first round, but other than that I’m convinced you need a balanced approach. The Pirates might as well not have fielded a GCL team the last several years. They loaded their New York-Penn affiliate with college guys and eventually most of them, like Durham, proved they could play some, but they’ve mostly all turned into pretty good minor league players (like Brad Corley and Jason Delaney) and probably nothing more. There’s probably a better chance of coming up with a gem in the later rounds with HS players. Hopefully they did that this year with Jarek Cunningham. 20)Why do you think Brian Bixler and Steve Pearce were brought up this season and then sat on the bench? Do you agree with the office or was it a waste of their time and development (especially in Bixler's case) to do so??? Pearce didn’t stay long. I think they just needed a pinch-hitter for a few days. I didn’t blame them for bringing Bixler up because they had nobody else any good and he was on the 40-man roster and didn’t require a move. I’d certainly have played him more, but Russell obviously has a far higher regard for Luis Rivas than I do. After a horrible start to the AAA season, Bixler actually started to improve quite a bit when he went back down, so the stint in the majors may have helped him. He was fielding a lot better even before he went down, so the whole experience may have helped him loosen up a bit. Bixler’s improvements may also have helped the Pirates become less terrified about trading Jack Wilson if they get a good offer, although I doubt they have any illusions about Bixler ever being more than a barely adequate shortstop. Either the San Diego Padres are worse than I thought or the old adage that every once in a while,a blind hog does find the occasional acorn is true. In either case-Yoslan Herrera pitched six shutout innings and earned his first major league win (1-1) and the Pirates ran away to a 9-1 win for their 4th win in a row. Herrera did more than his part.but the bats were popping as each member of the Pittsburgh outfield connected for home runs over the course of the contest. Jason Bay (22) and Xavier Nady (13) hit back to back blasts in the fourth and Nate McLouth nailed number 21 in the eighth as insurance runs were added to an already large lead. McLouth finished the night with 3 RBI. The Cuban right scattered six hits,struck out four and walked only one. Pittsburgh slowly built the lead with 2 runs each in the 2nd,4th and 6th before adding three in the eighth. Not much else that I can add to this one. Slow night for Bullpen notes. Great fight on ESPN's Wednesday Night Fights as 168 pound contenders Jeff Lacy and Epifanio Mendoza hammered each other for 10 rounds. Lacy took a majority decision in the contest. We scored the fight for Mendoza 95-94. The Hagerstown Suns return home for a eight game homestand against the Greensboro Grasshoppers and Lexington Legends starting tonight. Part three of our talk with Wilbur Miller is below-enjoy! 11)Some have said Alvarez could be moved to first base,is this likely? I’m sure Huntington will want him to stay at third until he proves he can’t play there. Scouts apparently were divided on that issue, so it could probably go either way. 12) If Alvarez is cemented at third,is there any hope for Neil Walker and if so,is it back to catching or is 2nd base possible? I doubt he could handle second. He doesn’t look to me like he’d have the range. They won’t move him back to catching. He’s having enough trouble hitting to have to readjust to a position he wasn’t all that good at. 13)Here,we have seen Indianapolis,Lynchburg and Hickory as of this writing and have seen a few positive surprises,any for you??? At the upper levels the biggest surprise would be Jeff Sues. He’s got very good stuff and, unbelievably, he’s stayed healthy so far. His numbers since he got to AA got messed up by a couple bad outings, but overall he’s been amazing for a guy who pretty much missed his first three pro seasons. Other surprises have mostly been at Lynchburg. I certainly didn’t expect Jim Negrych to hit .360 after a mediocre year last year, but the problem may have been that he wasn’t healthy. Jamie Romak has been better than I expected, although the contact issues remain. Steve Lerud made a lot of progress. I could actually see him reaching the majors now, although not as more than a backup catcher. Another guy to watch who played little until Lerud’s promotion is Kris Watts. He’s a pretty good hitter and he bats left-handed, which is nice for a catcher. He’s bad defensively, though. Oddly, he looks a lot like Chris Shelton. I guess you could say Miles Durham has been a surprise, but he’s very old for class A. 14)The uproar over Daniel Moskos continues and his numbers are weak. Do you see any hope or could this be a case of a player that that could be crushed by public perception? I guess you’d have to know the guy. I doubt young athletes really care much, though, about what people are saying online. As torrential rain fell outside the covered roof of Minute Maid Park,the bats were hot inside as the Buccos took command of the game from the first pitch,watched the Astros match every shot until the final blow went the way of Pittsburgh as the Pirates took an 8 -7 win and a sweep of the three game series. Ironically in a game that was filled with big plays,the difference maker was a fielders choice by Jason Michaels in the seventh that scored Xavier Nady to make the game 8-6. When the Astros answered in the bottom of the inning,they could not even the score as they did most of the game and settled for trimming the lead to one. They would get no closer. The Pirates staked Ian Snell to a four run lead after their bats in inning one as Ryan Doumit's sac fly was worth a run and Jason Bay smacked number 21 into the seats for two more runs. Snell himself singled in the innings final run. But he promptly gave three back to the Astros in the bottom of the inning. This was the beginning of a trend as Freddy Sanchez doubled home a run in the second,Snell gave the run back. Doug Mientkiewicz doubled and scored Adam LaRoche (1 of 4 on the day for Mientkewicz) ans Snell allowed Houston a run in return in a bizarre give and take and that was all for Snell. A truly bad outing for the diminutive righty- 3 innings,5 runs and being KOed early meant more work for the bullpen. In the only positive for Snell,he did fan six Astros (see,I am not all negative). T.J Beam then allowed the tying run in the fourth and the game then stabilized until the seventh,where the Pirates used a Mientkiewicz single and the mentioned fielders choice to outweigh the Houston run allowed by Tyler Yates. Flammable Frankie Osoria fired (pun intended ) two hitless innings and grabbed the deserved win and moved to 4-3,while Damaso Marte closed the show with a scoreless ninth for his 5th save. The Pirates finally return home for a seven game homestand against the Padres and (gulp) Rockies starting tomorrow. Rush to the windows for tickets to see Yoslan Herrera and John Van Benschoten now-they are going fast! At least on Friday,you can get Forgotten Superstar Al Oliver's bobblehead! Frank Coonelly is frustrated about the slow pace of negotiations with Pedro Alvarez. OK,I can buy that,but how frustrated is he about not getting anything done with Robbie Grossman,Andrew Gagnon.Quinton Miller,Zach Wilson and Wesley Freeman??? Kelly Pavlik moving up ten pounds for a non-title bout against aging Bernard Hopkins on October 18th in Atlantic City. I don't see Kelly knocking the iron chinned Hopkins out,but he will be far too busy and should come away with a clear decision. The Chargers released wide receiver Eric Parker yesterday. Parker missed all of last season with a foot injury,but he was the Bolts leading receiver in 2006. Look for the Browns to make a fast move on Parker to add depth at the pass catching position. Part three of our talk with Wilbur Miller up later today. Here is part two of our interview with Wilbur Miller. I have decided to wait until it is all posted to add any thoughts that I have on the interview. 6)The 2008 draft looks so good on paper,do you have any thoughts on why so few of the high risk players have signed? I’m trying not to think about it much, because I’m going to be bitterly disappointed if they don’t sign a few more of the higher ceiling players. I can think of several reasons why so few have signed. One is simply that the tough signs—which is all the guys they picked who fell due to bonus demands—almost always sign at the last moment. That tendency may be stronger with the Pirates this year because agents and draftees have probably seen the rumors that Coonelly wanted to draft Alvarez specifically to show Pirate fans he’ll go over slot. That might have encouraged the draftees to hold out for more money. Same thing with MLB’s recommendation to the teams to draft based on talent and not slotting. The thing that worries me the most is the Pirates’ “internal value” system, where they say they generally won’t exceed their calculation of what a player is worth to them. If the idea is that something other than market value is going to govern their negotiations, it could become nothing more than a more sophisticated excuse not to spend money. 7) Of the "at risk" picks,and excluding Alvarez and Scheppers,which do you recommend the Pirates sign the most and why? Rob Grossman seems to have the highest upside. They sure need some pitching, though. Quinton Miller might be the next best choice. 8)Any concerns on the possible abuse of the arm of Justin Wilson at Fresno State this season? Yep. The same coach did a number on Scheppers. Hopefully, he got shut down before the abuse could do lasting damage. It doesn’t look like it’s going to matter with Wilson, though, as he appears unlikely to sign. Can’t blame them for that if his expectations got out of hand due to his CWS heroics. He was not one of the players they drafted who would have gone earlier based on talent alone. 9)The Pirates seem to produce soft tossing pitchers and power starved position players,besides poor evaluators,is there any other reason for this? Bad philosophy. They seemed to think ground balls are better than strikeouts and drafted pitchers accordingly, ignoring the fact that pitchers who don’t miss bats in the minors don’t do well in the majors. So it wasn’t just bad player evaluation, but poor analytical ability. They also seemed to have templates or stereotypes that they used for all players. RHPs had to be 6’4” or above with lean body types. Hitters seemed to be drafted according to how they fit the stereotype for a position, with hitting being a secondary consideration. They also clearly didn’t value plate discipline. Just look at the majors. They didn’t like Doumit because he’s a little short on some of the classic catcher defensive skills. They typecast McLouth as a 4th outfielder because he doesn’t have sprinter’s speed. Never mind that he’s as good defensively as Nyjer Morgan because he gets better jumps. On the whole, I think they were obsessed with stereotypes and unable to analyze the things that make players productive. 10)Neal Huntington kept much of the scouting staff and minor league coaches intact due to his late hire,do you foresee changes in the off season with more time to hire? Yeah, it takes time for the changes to reach down that far. I’ve seen that in places where I’ve worked, when upper management changed. No reason baseball would be different. Freddy Sanchez set the stage early and Paul Maholm never allowed the Houston Astros to change the script as the Pirates grabbed a 8-2 win over the Astros in Houston. Sanchez continued his sudden turnaround with a long homer (7) in the first inning to give Maholm a lead that he would never be challenged for. Sanchez added another RBI later in the game and the Pirates also added homers from Nate McLouth (20) and Ryan Doumit (12). Doumit's shot was the final blow to any Houston comeback hopes as it was a three run bomb in the seventh. Maholm cruised through eight innings and allowed just one run in moving his record back above .500 at 7-6. Sean Burnett allowed a run in mop-up duty in the final frame. In a season filled with discouraging items,the one thing that seems to be a positive is the gradual improvement of Maholm. The Mississippi southpaw continues to give a performance that most times out give the Pirates a opportunity to win and with this team-that is as much as you can ask for! However,before we get too excited about the maturation of Maholm,recall that this time last year,everyone (Myself included) were counting on Ian Snell and Tom Gorzelanny as stalwarts of the future as we watched them pitch last season. I guess,we can hope though,right???? The Pirates attempt to sweep the Astros in a matinee' today and a win would make the difference between a bad road swing and one that was average. Todays game will be televised only on the Houston network. I always prefer the Pirate feed,but at least that makes it a no Greg Brown day! It seems that FSN Pittsburgh rarely shows any of the afternoon weekday games. I know the Pirates are not a huge TV draw,but they have to beat the 800th replay of Sports Science. Bob Smizik has a great column on the devastation that was left in Pittsburgh by Captain Dave and his locust brigade. It still turns your stomach,but these things need to be revisited from time to time in order to appreciate the task that Neal Huntington has ahead of him and therefore give the guy a break!!! The struggles of Daniel Moskos continues at Lynchburg and unless his numbers do not pick up,one could make a legitimate argument that he should start next season back at Lynchburg instead of the assumed automatic promotion to Altoona. The Cleveland Browns signed all five of their draft picks and will have all of them in camp on time. The two highest picks,linebacker Beau Bell and tight end Martin Rucker were 4th rounders and are expected to challenge for playing time. Bell has a chance of being a starter with an excellent camp. Two additions on the signing front as Ebay produced a certified David Clarkson autograph and former Columbus enforcer Jody Shelley signed two through the mail. Wilbur Miller was kind enough to take his time and do an interview with us that I have wanted to do for a long time. This 4 part interview with five questions in each part covers various issues and thoughts on the Pirate system,their philosophies,certain prospects and more. I hope to have Wilbur do another one of these on the big league club after the season either in this format or a round table type with myself and perhaps someone else. I will add a post on my thoughts on the interview after it has been completely posted. Thanks again to Wilbur for his time and I hope you enjoy it as much as I did. 1)How do you see the future of Andrew McCutchen? Do you see him as a high end player or merely a good player that looks better in a bad system? Probably more like a pretty good player who should be an average or a little above average starting CF. His performance has never really matched the hype. He seems to lose focus or something, and gets to where he can’t lay off the sliders. Maybe the challenge of playing in the majors will lead him to stay as focused as he apparently was early this year and he’ll blossom. Failing that, there isn’t much reason to see him as a star. 2)Assuming the Pirates sign Pedro Alvarez,how do you see a possible result for a Alvarez-Neil Walker position battle? Unless Alvarez is a huge disappointment, there won’t be a battle. Walker will move to the OF. 3)Besides the obvious Littlefield/Creech reasons,is there a lesser known reason for the state of the system? A lot of things seemed to change with the Aramis Ramirez fiasco and one of them was the approach to the minors. They hadn’t been doing well with the draft up until then and the international scouting was non-existent, but I thought there was a distinct downturn. For instance, they stopped drafting high school players almost entirely and loaded up on low-ceiling college players, an awful lot of them seniors. I don’t know what exactly was going on. Maybe Littlefield told the scouts he wanted players who could reach the mid-levels quickly to help the won/loss records and impress McClatchy. Maybe they wanted to be sure they signed a lot of guys, especially their first ten picks, again to keep McClatchy happy and create some positive PR—that would explain the fact that they frequently overdrafted in the early rounds. They also focused heavily on relievers, which seemed to be an effort to get help for the majors quickly. Bottom line was that, after the Ramirez trade, I thought they pretty much abandoned any pretense at building up the farm system. The entire focus seemed to be moves that were designed to preserve Littlefield’s job by impressing McClatchy, who appears to have understood virtually nothing about baseball. 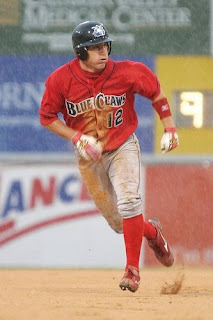 4)Steve Pearce has not had a huge year at AAA Indianapolis,Do you think he has leveled out as a prospect? Probably. At his age, whatever breakout he was destined to have most likely happened last year. He’s not adjusting to offspeed stuff and, even though he’s improved steadily over the season, he hasn’t had a really good stretch yet. He seems to be surviving more than thriving and he’s too old for that. 5)Considering the surprising numbers of Todd Redmond at AA Mississippi,do you still think Redmond for Tyler Yates was a good idea? It’s easy to say that in retrospect. I thought it was an OK deal at the time, one that would have little impact on either team. Yates isn’t as good as some people seem to think—his ERA is a prime example of reliever ERAs sometimes being misleading. His control is just awful. 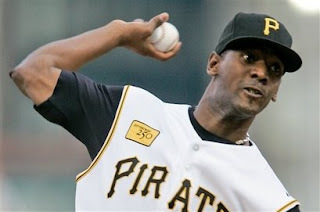 And if Redmond was still around, he’d be in the Pirates’ rotation now, which isn’t saying much. I still think in the end the deal won’t amount to that much. I’m skeptical Redmond will be more than a marginal pitcher. The Pirates were down to their final three outs, looked to have lost to yet another lousy pitcher in Runelvys Hernandez and their losing streak was about to reach six games. Worse yet,Hernandez was gone from the game and closer Jose Valverde was in. I mean these are the Pittsburgh Pirates. But as Howard Cosell used to say on the Monday Night Football halftime highlight-But No! Jason Bay (20) and Adam LaRoche (12) each sent Valverde offerings over the wall and Freddy Sanchez then smacked an inside the park job (6) off Tim Brydak to cap a seven (yes,that is seven and not a misprint) run ninth and a 9-3 Pirate win. And as an added bonus-John Van Benschoten pitched passably in allowing three runs (2 earned) in 5 innings and his ERA dropped to 75 on the season (just kidding,but it did drop to 8.27). JVB walked 4 which is way too many,but this clearly was his best game this year and likely earned him another 2 or 3 starts of getting his head pounded in. 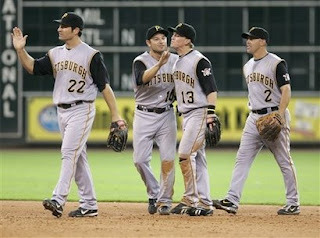 The Pirates had scored single runs in the 3rd and 5th as Bay and Sanchez each singled in a run to set up the heroics. Bay finished the night with four hits and Sanchez,along with Nate McLouth,added three. Give some credit to the bullpen too,four pitchers combined to keep the Astros off the board for 4 innings and keep the game tight. Tyler Yates was the beneficiary of the offensive barrage as he picked the win from the scrap heap and improved to 4-2. I was able to watch the first seven innings before leaving for work,so I missed the grand finale'. Damn Central Time Zone games! Series continues tonight at 8. The New Jersey Devils made a few signings to add veteran leadership to the Lowell Devils and add depth in case of injury to the Devils. Center Fedor Fedorov returns after two years of playing in the Russian league and the former Ranger and Canuck will likely be at Lowell for most of the season. Scott Clemensen returns to the Devils organization after a year in the Toronto system. Clemmensen will likely be the part time goalie and veteran mentor to Jeff Frazee in Lowell. Prospect Petr Vrana was also re-signed to a new contract as well. Vrana is expected to compete for a spot on the parent roster in training camp. Starting later today,We start a four part interview with Wilbur Miller on the state of the Pirates farm system. I may add a few comments with them as we go along or I may add my take on things after everything is posted. Thanks to Wilbur for taking his time to do this. Recently,Battlin Bob sent me a link to a comment made on another blog that mentioned his blog in a negative light. I was not aware of this blogs existence and the blogger himself never wrote about Bob or his blog,so it was not what was written that got me thinking about this topic. Is being an independent blogger better than an affiliated blogger? Being a house organ has its advantages. 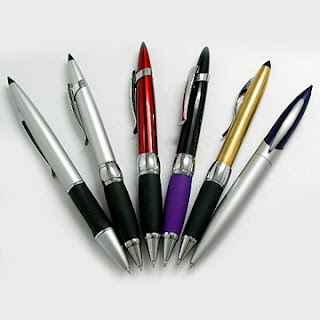 Your access is much better to people that you want to talk to,I am sure you get many more interviews and your audience is much larger due to the amount of distribution your writing will get. I mean,I would bet that the Hagerstown Suns get 15 hits for every one we get and the Pirates probably get 250 or more for every person that arrives here. But are you getting to say what you want to say? After reading the various MLB team sites,I would say that I doubt it. The Suns site is not hard hitting,but their site is more of an informational page,not filled with columnists and opinion based items,but the MLB sites is filled with softballs and snow cones that are sugary to the point of sickness. I understand that point of not wanting to criticize your own product,but swinging so far in the opposite direction sends fans that want true analysis and opinions scurrying to the independents for honest thoughts. Not dreck like this on "New crop of talented young players break into the bigs" that features Yoslan Herrera???? Not that being an independent is all sunshine and lollipops either. Interviews can be hard to get as teams frown on talking to non-traditional press,even when you are dealing with guys that would like to do them. I mean,we have gotten some,Erik Arnesen did one for us last season and Cory Van Allen has agreed to do one in the off season,but we could have had so many more. On occasion,we have gotten a post or a email that asks why we don't give the Suns a chance to rebut or discuss some of the issues that I have written about and to be honest,that is a fair question. I suppose I would say that I have not tried because I figured the answer would be a quick and painless No and we would be back to square one. They would not have to say yes and I understand that. What would they gain by dealing with an independent blogger that reaches three digits in visitors on a good day? The various organizations already has the "go team" crowd that gets upset with any criticism and wants nothing except that things are terrific in their pocket already. Really,that type of fan needs to go to an official site-that suits them and their needs and I have no problem with that. In the end,there are checks and balances to both sides of the issue. Do you want access at the cost of your own opinion? Do you want complete control at the cost of access? Answer those and ones decision is pretty clear cut. Until tomorrow and the pitchers duel you have been waiting for:JVB vs Hernandez!! I would like to say that it cannot,but with the return of John Van Benschoten that is far from certain. After a disastrous start to the second in Colorado with four losses and awful efforts by all the starters except for Paul Maholm,who was merely average (which makes Maholm Cy Young on this team),things look no better when you hand the ball to Van Benschoten and expect the results to change. I think that I will pass on post game autopsies on the weekend and instead address some various Pirate issues. The Pirates need to go 38-26 the rest of the way to achieve that .500 mark that seems to be so important to the organization. Well,when the ace of your staff has become Paul Maholm,that does not bode well for a run of the type that is needed to reach .500. Zach Duke was great for 3 innings and followed up with 9 runs in the next two innings. Ian Snell has looked improved in his last two starts,but far from the electric hurler that was around in 2007 and JVB and Yoslan Herrera are beyond any hope. Sadly the guys that they are running out are the best that they have now,unless you are ready to give Tom Gorzelanny another try and that does not say much at all. Pirates fans are going to have to run with what they have and take their lumps. There is hope though-be bad enough for another top two or three pick in the draft. This will eventually turn things around (see Tampa) if you take advantage of these picks. Of course,a numbskull (Dave Littlefield) can still screw this plan up. The trade deadline looms and surprisingly the Pirates seem to want to keep the current core together. Looking at the team,I find this hard to believe as the Bucs are not playing a bunch of youngsters like Tampa Bay and as a result do not look to have a huge future with these players. I like Jason Bay a lot and I would not give him away,but his value may never be higher. Same with Xavier Nady,except even more so as his ceiling is not nearly as large as Bay. I can see keeping Damaso Marte as the two picks that they would get as compensation for leaving might be better than any trade offers they may get,but perhaps a contender could use John Grabow at a cheaper cost? It is so obvious to me that Freddy Sanchez has not been healthy all season. And I could care less what Sanchez,John Russell,Neal Huntington,the team doctors or anyone else says to the contrary. The guy grimaces in pain every time he swings the bat. The best thing for everyone involved is to shut him down for the year and let his shoulder heal and be ready for a comeback 2009 season. I was one of those that loved the Pirate draft,but it appears that barring a late charge that the picks that looked so good are not coming to Pittsburgh. Pedro Alvarez will get done because they have to and Tanner Scheppers too if he is healthy enough,but any of the other interesting picks do not look to be signed and that is discouraging. Speaking of discouraging,check out the red flags on 5th rounder Justin Wilson. Wilson threw a lot of innings and a lot of pitches and might be a injury waiting to happen after being abused by Fresno State this season. Hard to believe they found someone with worse numbers than Van Benschoten isn't it??? All for now,might be back later with a thought that was triggered by a forward sent to me by Battlin Bob. Three Colorado home runs, 1 of which was of the inside the park variety and a run that was caused by an umpiring error added up to a Rockies 5-2 win over the Pirates in Denver. The umpiring mistake did not cost the game,but did show that miscues can be costly. The Colorado radio announcers thought that Wily Taveras was clearly out on a steal attempt at second,but was ruled safe. Taveras then scored after taking off for third and Ryan Doumit's throw went flying down the third base line. In the big picture,it made little difference. In the small one,it is the type of mistake that a team such as Pittsburgh cannot afford to have made against them. Ian Snell allowed four of the runs in six innings and watched his record spiral to 3-8. Snell had control issues early,but did settle down a bit and pitching better in his later innings. Of course after you are behind a few runs,the pressure is not as great. Jose Bautista hit his 11th homer of the year in the third and Jason Bay's 6th inning sac fly accounted for the other run. The series continues tonight at 8. I know that usually when the matchups on the mound stand up this much it tends to not work out,but looking at the two starters seasons stats,it sure looks as tonight is going to take a lot of runs to win! Brad Lincoln was roughed up in his Carolina League debut in Woodbridge against the Potomac Nationals as he allowed five runs in 4+ innings of work. Lincoln will make his next start at home in Lynchburg. Cleveland Browns training camp opens Wednesday and the news on Joe Jurevicious is not good as the wideout was placed on the physically unable to perform list. This does not mean that the veteran has to miss any time in the regular season yet,but the likelihood is increased. The news should increase the rumors of a trade with the Chargers for Eric Parker to cover the gap left by a possible long term injury to Jurevicious. The Milwaukee Brewers were seen scouting the Oakland-New York series to take a look at Huston Street. Could Billy Beane be at it one more time? Would Milwaukee surrender former West Virginia third baseman Mat Gamel in the deal??? Short post today as an attempt to fix the PC appears to have worked,but all programs and Firefox bookmarks needed to be reinstalled and I therefore want to keep things short. One of our favorites is headed to one of our favorite teams as Adrian Carde nas was one of three Phillies to be shipped to Oakland for Joe Blanton yesterday. Oakland continues to add talented young players and Adrian should do very well there. Cardenas was hitting over .300 at High A Clearwater. The other players involved in the deal were former Lakewood pitcher Josh Outman (at AA Reading) and outfielder Matt Spencer also at Clearwater. Cardenas may have been my favorite visiting player ever and long time readers will remember Adrian giving me a cracked bat of his and signing it for me. A good trade for the A's and this is going to be one fun team to watch in about two years! The Pirates lost in Colorado to the Rockies 5-3 as the Rockies rallied to score t he final five runs of the game to overcome a early Pittsburgh lead. Pittsburgh scored three runs in the third as Nate McLouth scored on a wild pitch and Adam LaRoche's double scored Freddy Sanchez and Jason Bay to build the lead,but things were all downhill from there as Paul Maholm could not hold the lead (6-6) as he allowed 2 runs in the 4th and the game winners in the 6th. I listened to the game on the Colorado network via XM and will do the same tonight,so I don't have the details or opinions from watching. I have had this lying around for the last few weeks and never got around to posting it. It is ironic that I liked 5 of the Pirate picks and kept them for my own,but as of today only one of the five picks that we share have signed. We will keep an eye on who signed and how they played sometime over the winter. I do not have the pictures for this yet,but I wanted to get this up and finished before the return of the Pirates tonight in Colorado. I attended a CPW wrestling show a few weekends back in my first live wrestling show in about 13 years and had a few thoughts on it. One,this is more like 1970's and 80's wrestling than the product shown on television today. Two,the fans are worse than I remembered. Three,for guys that are not getting paid a mint and do this for the love of the business,they certainly went all out to provide the audience with what they came to see. Please keep in mind,I am not a huge fan of Independent Wrestling. I find it hard to suspend temporary belief when the guys in the ring are the same fellows that you see working everyday jobs like the rest of us and when wrestling is at its best-that suspension of what wrestling is for a few hours is what makes it fun. That said,the grapplers on this card in Riverbend Park did what they could do (sometimes well and sometimes not so well) to entertain a larger crowd than I expected and I would say most of the fans came away having had a good time. Some things were right out of old school wrestling,guys belittling fans and telling them to shut up etc and were quite funny. Others were not so amusing as fans getting overly liquored up and wanting to be part of the show instead of watching the matches. The CPW wrestlers tended to keep the matches inside the ring and used more on the mat moves than the nationally known products and that tended to make the matches more slow paced and attempted to tell more of a story than the "crash television" that wrestling has become today. CPW attempts to bring in one or two top names from the past to each show to at tract the casual or old time fan. On this day,Demolition Ax from the 80's and 90's WWF tag team champions was the star of the show. This tends to bring in a few extra fans that may not usually attend,but might want to bring their kids or grand kids to see someone from their youth and considering the rural Virginia and West Virginia towns that CPW runs this is usually as big of a celebrity that these towns will ever have appear. Is small time wrestling for everyone? No,but for small towns that have little that come there and wrestlers that have no designs on ever being a full time star that wrestle for a few dollars and the chance to do what they enjoy best-it sure is. 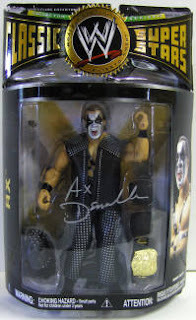 Thanks to the CPW guys for giving me access to the card and giving me the chance to meet Ax (Bill Eadie) behind the scenes and add some cards to the collection. The Pirates return to action tonight in Denver against the Rockies at 9. I will be listening to the game via XM at work on the Rockies network. After his terrific performance against the Hagerstown Suns,Brad Lincoln was promoted to Lynchburg before yesterday's game in Frederick. Lincoln joins the Hillcats to bolster their rotation for their second half title bid. The Hillcats are just a half game behind first place Potomac and they visit the Nationals for a four game set that starts tonight. Lincoln is scheduled to start the Friday game. The parent club in Pittsburgh recalled Marino Salas for the 40th time this season from Indianapolis and returned Romulo Sanchez to the I-Tribe. Salas will be in uniform in Denver tonight. 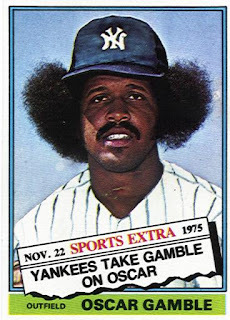 The Cleveland Plain Dealer has a look back at one of the coolest cards of the 70's and where Oscar Gamble is today. The former Indian outfielder's 1976 Traded to New York card is representative of the hair style of its time for sure! Until next time when we finally have a game to talk about! Today I wanted to discuss the biggest one for one baseball trade of the 70's,although not the most influen tial to a kid from the 70's(who happens to write this blog),but that is for another day. In the winter of 1975,the New York Yankees swapped their most popular player in Bobby Murcer to the San Francisco Giants for Bobby Bonds in a deal that involved two terrific outfielders that were disappointments to fans of the respective teams. Murcer was heralded as the "next Mickey Mantle",while Bonds was regarded as the "next Willie Mays" and despite becoming terrific players,neither were able to live up to those high standards. After all,those are two of the greatest players ever. Murcer arrived in San Francisco at the age of 29 and having made the American League All-Stars for the previous four seasons. Murcer's 1974 numbers were down from three terrific seasons previously but the numbers could have been affected by the Yanks temporary move to Shea Stadium. The lefty swing of Murcer produced many homers down the short right field line in the Bronx,but were not enough to leave the park in the larger Shea. Murcer's power numbers fell from 22 to 10 and his average tumbled 30 points as well. Murcer had spent the season in right field after spending his career in center and the move likely did not help his adjustment to the larger confines of Shea Stadium defensively either. Bonds appeared in Gotham at 29 as well and was a two time National League All-Star member. Please remember though the NL was the far superior circuit at the time and it was much harder to make a All-Star team in the National League than the younger league. Bonds numbers had slid a bit in 1974,but one could not expect less after just missing by one homer being the first man to ever hit 40 homers and steal 40 bases in one season in baseball history in 1973. Bonds average spiraled downward 27 points,his power numbers moved from 39 to 21 and his RBI totals dropped from 96 to 71. So looking at this deal beforehand,Bonds hit more homers and would steal many more bases than Murcer,but Murcer generally hit for a higher average and struck out far far less less than Bonds. Both are the same age and with the exception of the one year stint in right for Murcer were center fielders. Do you do this trade? Honestly,looking at things from the 1975 perspective,I would be more likely to pull the trigger if I was getting Bonds than I would if I was getting Murcer,but I can see getting the more reliable Murcer than the boom or bust of Bobby Bonds. Ironically,neither player was playing in their new home by 1978. Bonds spent one season in New York in which his numbers looked great,but was never truly accepted by the Big Apple faithful in adding another 30/30 season with 32 homers and 30 steals and making the AL All-Stars. Bonds was shipped to the California Angels after the season for two players that would figure prominently in the Yankees pennant winning teams of the late 70's in Ed Figueroa and Mickey Rivers. Bonds would travel from team to team for the next few years going from the Angels to the Chicago White Sox to Texas to Cleveland putting up his usual numbers at all stops before finishing his career as a backup for the Cardinals and Cubs. Murcer would make the NL All-Stars in 1975 in a .298 and 91 RBI season,but hit just 11 homers. Murcer changed his swing in 1976 and increased his power numbers in hitting 23 homers but watched his average plummet almost 40 points in doing so. Murcer was sent to the Cubs in 1977 as part of a multi-player trade where the main return for the Giants was Bill Madlock,where he hit 27 homers before eventually returning to finish his career as a Yankee as a backup outfielder and pinch hitter. In the end,both of these players are excellent,top of the line players,but if I had to choose between them-I give the edge to Bobby Bonds..
A one for one trade of superstars in their prime does not happen much anymore,but when they do they always are remembered fondly. I must admit I was more of a Bonds fan than a Murcer fan when I was a young baseball fan. My most fond memory of Bonds was a pregame hand slap during my first visit to Cleveland Stadium in 1979 as Bonds was spending his only season with the Tribe in what proved to be his last good season. Take a look at the airbrushed hats on the 1975 cards of Murcer and Bonds that are pictured. The trade happened late in the Topps press run and they had to settle for that instead of cards that showed them with the new caps on. An excellent blog by Joe Posnanski on the Bonds-Murcer trade can be found here. Look for the next poll to be on the Bonds-Murcer trade. Billy Packer out at CBS and Clark Kellogg in? I know many hate Billy Packer,but I have always enjoyed the honesty and candor of his work. Plus living in MD,ACC fans got Packer way before the national fans as part of his terrific team with the late Jim Thacker on the Pilot Life ACC network. Maybe sometime during hoop season I will reflect on Packer and Thacker. On the other hand,Kellogg is the basketball model of Jim Palmer in sounding like he is almost asleep. I dont hate Kellogg,but far from a fan either. The Hickory Crawdads continue to touch up their pending application on owning M unicipal Stadium after splitting a doubleheader on getaway day in Hagerstown. Hickory is now 10-2 in their last three visits to the Hub City after winning Game 1 8-1 and losing Game 2 in extra innings 6-5. I don't plan on getting too detailed on the game itself,but rather concentrate on the evening and the Pirate minor leaguers that I saw over the series. The evening was fun,my brother got to go on field and ham it up with the Suns guy with the microphone and I was able to sample some of the most revolting food known to man along with some pretty good stuff. This was Feed Your Face Monday,so I decided to try as much on the menu as I could and try some food that I normally pass on. This brought some good and bad stuff to the palate. The good:The french fries were really terrific.Really good stuff. If you try FYF night,try the fries. Soft Pretzels and Popcorn are not bad either,especially the popcorn which is highly salted (which I like). If you are attempting to keep your salt intake down,keep that in mind. The Average:The nachos are OK,not great,but certainly nothing terribly wrong with them either. The cheese saves the day in more ways than one. The Bad:The popcorn chicken had the texture and taste of a burnt brick. Awful and I had two witnesses that attempted them too,so that is not me on a tirade either. The hot dogs are bad. I mean really-Would you eat this?? No way around that unless you use the cheese from the nachos to disguise the taste of the dog. The worst thing is that it seems like most dogs are badly undercooked and come with these bizarre looking red stripes all over it,which makes it look like something that the Cardassians cooked up on Deep Space Nine. Things are improving with the food,but the finish line is a long way from arriving. As far as the Crawdads go,another mixed bag. Pitching wise,Brad Lincoln looked very sharp,Duke Welker was solid and Michael Felix pitched well in his two appearances,but I am not sure if the pitching was that good or a weakened Hagerstown lineup was that bad. I talked to Felix before the series finale and discussed that some of the Lynchburg Hillcats had said that he had found his control in spring training and that they were surprised that he had been assigned to Hickory instead of Lynchburg. Mike told me that was a good thing as shortly after the season had started his mechanics had went off kilter and it took a while for him and pitching coach Jeff Johnson to correct those issues. Felix fired three shutout innings and earned the win in Game 1. I really like Lincoln's stuff a lot and have higher hopes for his future than I did before the series. A fastball that stayed in the neighborhood of 93 and a super breaking ball makes me cautiously optimistic about a breakout season next year. I would like to see him use his change more,but for now I am pleasantly surprised about how nicely his fastball has returned. A final note on Lincoln-there is no way that he is six foot as listed-5'10 is a better bet. I stood right next to him and I had at minimum 2 inches on him and I am 6'1. Welker pitched well against the Suns,but I am more reserved on the Duke. The umpire appeared to have a generous strike zone on the night for Welker and Hagerstown's Colton Willems and when you combine that with a weak hitting team and far from overwhelming stuff to me the jury is still out. I do look forward to getting a second look next season at the Arkansas product. The position players are a point of concern. Matthew Hague,a third baseman from Oklahoma State,continues his meteoric rise through the system as he hits everything hard. Hague was hitting hard outs in the series and drilled a long homer in the visit as well. Hague was a 9th round pick in the June draft and has already jumped State College. I would even say Hague could make a Lynchburg visit,but the Pirates apparently are committed to keeping Jim Negrych in Lynchburg all season. The other 2008 draftee is struggling a bit at the plate as third round shortstop Jordy Mercer (also from Oklahoma State) isn't adjusting to the SAL pitching as well as Hague. Mercer seemed sure handed at short,but seemed to be bewildered with the wood. His bat speed seemed fine,so I think that is not the issue. I don't place too much on college players struggling initially as they have had a long season already,but I will keep an eye on Mercer's plate issues early next season. I liked what I saw of catcher Andrew Walker,but he was injured in Game 2 and sat out the next two games. Walker should be the Lynchburg receiver next year. Other than outfielder Erik Huber,who showed some power flashes-Hickory's bats appear to be kinda weak as the final Ed Creech draft class begins to creep through the system. A few things to have some optimism about,but overall,I am not too excited. I was able to get everything signed by Hickory. Brad Lincoln was super accommodating and Duke Welker signed everything as well. Welker was not super chatty as he was the starter that day,but he signed for all. Mike Felix and Charles Benoit talked a bit as they signed. Benoit got his first look at his Lynchburg card from this season and showed the card to teammates. Bobby Spain signed despite a cast on his hand in a very nice move and Jordy Mercer signed the only card that I had for him. Some complained about Mercer,but he signed my card right away and gave me no problems,but I did see him not sign for others. A funny note on the final night. I had some extra stuff that needed to get signed so I deputized Corey to help out and he was down to just Hickory skipper Gary Green and tried to get him between games. But as Green approached,Corey began to shout for "Bob". After about five shouts for "Bob",I told Corey-"his name is Gary". Laughter then ensued as Corey then laughed and asked rhetorically "where did I get Bob from"???? Corey consider yourself lucky-If I didn't have a Bob around already,you would have became Bob last night!!!! I need just one Hagerstown player to finish the Suns set with the players that are on the roster. Pitcher James Lehman is the only current need.. The title says it all as the Pirates erased the excellent and exciting rally from Saturday's win with a loss on Sunday led by the always explosive bullpen. On Saturday night,the Pirates used an astounding late power surge with three home runs in the last innings to lift Pittsburgh to a stunning 11-10 win over the Cardinals. Jason Michaels ended the game with a two run longball (4) to end the game in the 10th after the Cardinals had taken the lead in the top of the tenth. Michaels shot foiled the St.Louis offense that pounded Pittsburgh pitching for 22 hits and was the third of the three seat shots that kept the Bucs in the game. 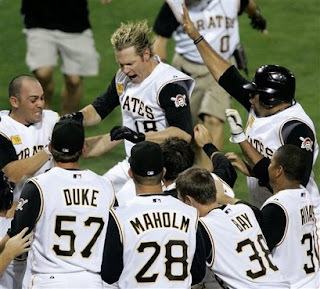 Jason Bay smacked the second of his two bombs (18 & 19) in the eighth to cut the lead to 10-6 and as part of a four run ninth that forced the extra frame,Nate McLouth slammed his 19th of the season. Earlier in the game,Adam LaRoche hit his 11th of the season. Bay finished the evening with five RBI in his season high. Yoslan Herrera was as ineffective as projected as he was pounded for six runs in four and a third innings and allowed 11 hits in the span. 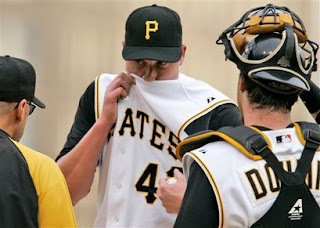 The bullpen was bad as well,as the Pirates used six members of the pen and only two escaped without allowing a run. Denny Bautista got the win (3-1) despite allowing a run in his only inning. The air went out of the tires just hours later as the Pirates continued their trend of falling behind,scrapping their way back into the game and watching the bullpen hand the game to the opposition. The Cardinals leaped to a 4-1 lead,surrendered it and then used the appearance of "rubber armed" Franquelis Osoria to put the game away in a 11-6 St.Louis win. Xavier Nady singled in Chris Gomez in inning number one for an early 1-0 lead and Ian Snell seemed to be sharp from the start. That lasted three innings as the Cards scored 4 runs in the 4th with three of them on an Aaron Miles homer off Snell. Snell would last five innings,allowing the 4 runs on five hits,walking three and whiffing an encouraging six batters. The Pirates would tie the game in the fifth as Ryan Doumit doubled home Freddy Sanchez and Jason Bay then singled home Jack Wilson and Doumit. Each team then swapped sixth inning runs as Sean Burnett allowed a run in his only inning,but was picked up by Chris Gomez's double that gave the Bucs a 6-5 lead. But it was time for John Russell's favorite reliever Flammable Frankie Osoria to enter the game in the seventh and by the time Osoria left the game and recorded one out,the game was essentially over with the flammable one allowing four runs and the lead. The Cards would add an insurance run in both the 8th and 9th to finish the contest. Another winnable game that becomes a loss due to the bullpen and especially Osoria. How much of this guy should we have to see???? Sorry to hear about the passing of Bobby Murcer at 62. Murcer was the star of the not so good Yankee teams of the late 60's and early 70's and is most remembered for his 1 for 1 trade to the Giants in 1975 for Bobby Bonds. Look for a possible future post on the Murcer for Bonds trade as I love talking about the baseball for that time. 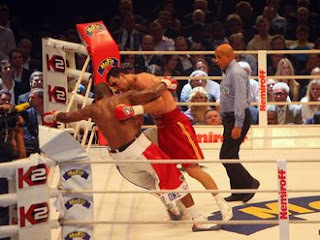 Wladimir Klitschko knocked out Tony Thompson in round 11 of a dull battle to retain his IBF Heavyweight belt. The heavyweight division is just almost hard to watch. Had Thompson thrown hard punches instead of being content to simply touch Klitschko,this could have been an interesting fight. Ted Nolan as head coach. Only a coach of Nolan's quality could have the less than talented team in the playoffs one year and contention the next and yet get fired. The Islanders front office gets crazier by the second and dumber too. Since today's post is coming late and I have not watched today's game yet,I will post on Saturday's stunning comeback win and today's game tomorrow. Last night in Hagerstown and after a two year wait,I finally was able to see the Pi rates top pick in the 2006 draft-Brad Lincoln. Lincoln dominated the Suns in his 6 and two third inning outing and picked up the victory in the 4-1 Hickory win. Lincoln allowed 4 hits,struck out seven and walked two Suns in what was one of his better starts all season. I was out of GA exile for one evening (thanks Luke),so I was able to check radar guns and pitch count was much easier to keep track of. Lincoln was consistently throwing around 93 MPH and I was really impressed with his 12 to 6 curve,which is what was called a "dropball" when I was a kid. I thought that Lincoln might have been as impressive as any pitcher here this season and showed glimpses of the talent that he showed at the University of Houston,which gives some hope for the future of the 4th overall pick. A few other notes on Lincoln and the Crawdads over the first two games thus far. Lincoln needs to continue his development as he turns 24 early next year. I am interested to see if Lincoln starts next season at High A Lynchburg or do the Pirates attempt to speed his development by skipping the Hillcats and starting him at AA Altoona and add Lincoln and (presumably) Daniel Moskos to the Curve rotation. Lincoln is listed at 6 foot in height,but I see no way that this is true. He appears to be 5"10 at best. Maybe I just caught them on good nights against a depleted Hagerstown lineup,but Lincoln and Duke Welker both looked awfully good in the series. But looking at the overall numbers,the weakened Hub City bats might be just as big of culprits as Lincoln and (especially) Welker. Lincoln was also pretty good with the pen as well as he signed several cards (offering a tongue in cheek "You guys aren't selling these are ya" with a smile along with a ball as well. Hickory does not give much hope with the lumber,except for one-third baseman Matthew Hague. Hague was a ninth round pick from Oklahoma State in the (2008!) draft and has already accelerated past State College and from what I have seen might even speed by Hickory. The only problem with that is the Pirates appear committed to keeping Jim Negrych at Lynchburg all season and therefore freezing Hague in the SAL. Everything Hague hits is hard,although it does appear that he is a bit pull happy. Third round pick Jordy Mercer is struggling at the plate and seems to be pressing a bit. Mercer also looked to struggle with the soft stuff against the Suns and considering that Hagerstown has no pitcher that throws especially hard,I had some concerns. But I have no final judgement on Mercer,sometimes college guys are just wore down and struggle in early pro exposure. Todays game was suspended after three,so the game will be completed tomorrow and then followed up with a seven inning finale. 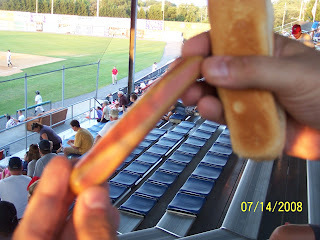 Two very heavy crowds for the first two games of this series and the Saturday game was clearly the largest crowd of the Hagerstown campaign. But todays rainout crowd was a humbling one as it did not look to be more than a few hundred scattered through the Muni. Suns third sacker Stephen King was ejected from another game in the Saturday game. I really hope King can control this temper a bit and succeed as he has loads of talent and is a really nice guy off the field,but these issues with umpiring are going to plague him as he climbs the ladder if he is not careful. Bagofhealthandpolitics has a take on King and the game from the Hagerstown perspective. Until tomorrow with bullpen notes and Pirate catchup! Gorzo gonezo,Maholm's effort goes for naught.